AND MAKE YOUR HOME LOOK NEW AGAIN? Pressure Washing Saves Money: Pressure washing is a wise preventative maintenance investment, like eavestrough cleaning, for exterior surfaces and it prevents costly repairs to your property. Additionally, pressure washing is very cost effective for cleaning large surfaces such as a home’s exterior. Pressure Washing Prevents Permanent Damage: Winter grime and salt causes serious damage and stains to a home and exterior surfaces if they are not properly taken care of and removed each Spring season. Once stain and grim settle in for extended periods, the damage can be permanent. Pressure washing removes the grim and salt quickly and easily with a low environmental impact, when compared with traditional cleaning solutions. 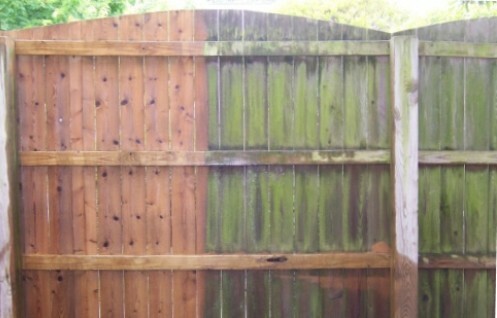 Pressure Washing Saves Time: There is no comparison between pressure washing and regular cleaning methods. Water is a very powerful resource and when used with a pressure washer, there is less scrubbing and physical strenuous requirements. Simply stated, hand washing does not have the same power, and would take many times longer to complete a job. 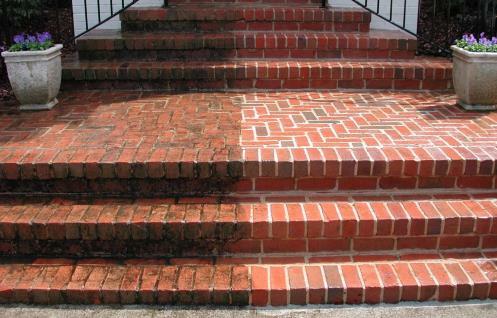 Pressure Washing Removes Allergens: With the arrival of Spring, allergen levels begin to rise. Homeowners can reduce the level of allergens around the home by pressure washing exterior surfaces. This environmental approach results in less coughing, sneezing and watery eyes and a much happier family. Pressure Washing Prepares Surfaces: After a long Winter, many plan out their Spring cleaning projects, which often include painting. Pressure washing is the perfect way to prepare surfaces for painting or refinishing. 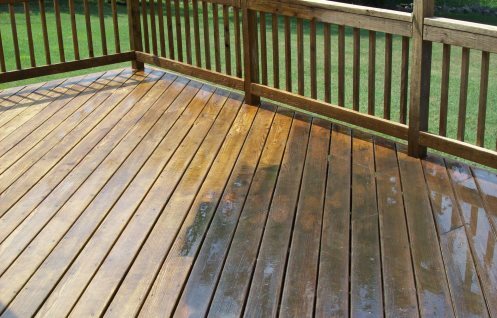 Even re-staining a deck can benefit, as do pool areas and more. There is no better tool to get such projects done. There are many other benefits that pressure washing accomplishes and should be a yearly Spring project. Pressure Washing is just another of Toronto Clear View Window Cleaning Inc., Toronto’s Multi-Award Winning Cleaning company’s service offerings. Do not hesitate to contact us about your needs. We offer free quotes and look forward to assisting you. Walkways are one of the highest traffic areas and succumb to the elements of nature, as well as what is on our feet. Notice Before and After picture. Similar to walkways, decking is another high traffic area, but has the added struggle with aging. Due to fences being vertical in nature, they do not get the same about of sunlight to help in drying. 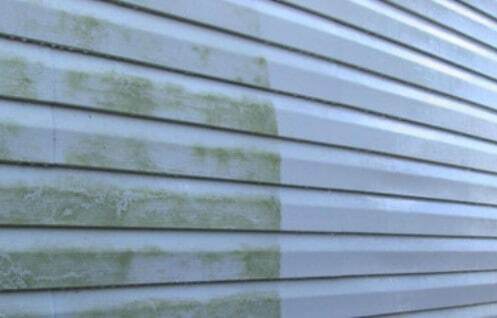 As a results, moss and mold quickly accumulate. Similar to fencing, siding also quickly accumulates moss and mold, but because they are often light in color, they “look” very unsightly.